Numerical optimisation algorithms take a problem, such as the optimal placement of labels on an ordination plot, and from a starting point iteratively improve the solution to the problem until it can't be improved any further. Many optimisation algorithms will only accept a better solution as the next update step in the optimisation. As a result, such algorithms tend not to explore widely the solution space from the starting location and can get stuck in a local optimum because they will only accept better solutions; once you are walking downhill in a particular valley you have to stop at the bottom of that valley if you can only walk downhill, even if a better solution is just over a slight rise. Notice that the random number generator is seeded prior to the call to ordipointlabel(); SANN can choose, at random, to move to a worse solution during optimisation and hence to get repeatable results we need to set the random seed. You will also have noticed that the plot doesn't appear immediately. The SANN optimisation is a slow process and even a simple plot such as the one we just created takes a second or two to optimise on my 18-month old laptop. The key class is "ordipointlabel", which has plot() method if you are running a recent development version of vegan (any revision >= 2537). If you're not, then you won't see any methods, but see below for a temporary solution. To illustrate reusing plt and to see how far we've come in decluttering the ordination, I conclude by drawing the default PCA plot and the one created in plt. 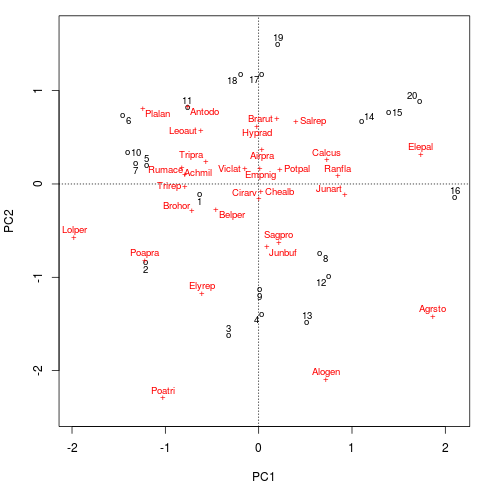 The eagle-eyed among you will have noticed that plt inherited from the class "orditkplot". orditkplot() is an even higher level way to declutter ordination diagrams. 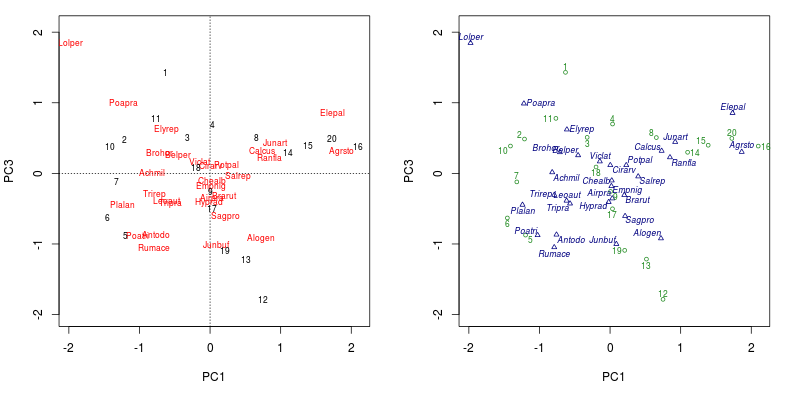 orditkplot() uses the tk toolkit and the tcl language distributed with R to implement a rudimentary GUI that allows you to move labels for points around on ordination diagrams and send the object back to R for plotting. I'll look in more detail at orditkplot() in the next post in this series.